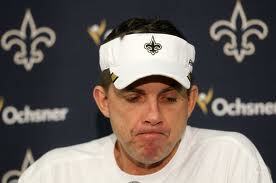 As of today the league has announced that the suspensions of Sean Payton, Mickey Loomis, and Joe Vitt have been upheld. Per the announcement the league said Commissioner Goodell gave “careful consideration” to the punishments handed out earlier this month. Sean Payton has been banned from the Saints facility starting April, 16 and will not end until the 2012 season is over. Mickey Loomis, GM of the Saints, will begin his 8 game suspension after the preseason as will Joe Vitt’s 6 game suspension. At the conclusion of each suspension Roger Goodell will review each one’s reinstatement individually. What does all of this mean to the Saints? First of all they are at a serious coaching disadvantage and must immediately start vetting replacements for their staff. Granted with an offense as gifted and deadly as the Saints it should not be that hard to find someone to hold the clipboard and let Brees and company do what they do. However, Drew Brees contract situation is still well up in the air. Brees ultimately refuses to sign the franchise tender and with the lack of coaching and front office personnel Brees may choose to just sit out this year and completely derail the Saints organization. This situation could very quickly go from very bad to even worse and if I were a stock market kind of guy I would make a power play to corner the paper bag market in the French Quarter. The Aint’s could make a less than triumphant return to the Big Easy.